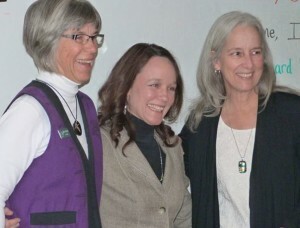 Colleen (center) receives Becker Award from Molly Madden (left) and Barbara Garrity (right). EEANM presented the 2013 Dr. Richard W. Becker Award for Excellence in Environmental Education to Colleen Langan-McRoberts, Open Space Coordinator for Bernalillo County. Colleen was hired in 2008 to develop educational programming for Bernalillo County Open Space properties. Her efforts have resulted in a vast body of work, including public events through the Backyard Farming, Naturalist and East Mountain Interpretive Series; the creation of the Master Naturalist Program; citizen science projects that promotes land health and environmental awareness; events communicating Aldo Leopold’s land ethic; and collaborations with many organizations to bring high-quality education to Bernalillo County. Colleen has worked with EEANM as a partner and collaborator to develop the EE Certification Program, the Environmental Literacy Plan and to expand networks with non-traditional partners with the Albuquerque Capacity Consortium. Additionally, she has created a number of interpretive signs throughout Open Space properties and worked with partners to develop publications such as the South Valley Bird Guide and 100 Years of Statehood: Celebrate New Mexico 1912-1202 Guide. She is currently President of the Alliance of Natural Resource Outreach and Service Programs. She has a Masters degree in Environmental Education. “Receiving this award is a tremendous honor. It is humbling to be acknowledged by my peers, and yet everything that I have accomplished has been through partnerships and dedicated volunteers—I share this honor with them and am deeply grateful to the Environmental Education Association for New Mexico,” stated Colleen. She will received a cash award, which she is donating to AIP Foundation, and a unique, engraved turkey call, a special tribute to Dr. Becker. Dr. Becker was a champion of conservation, environmental education and service learning across the state of New Mexico. He was a past president of the Albuquerque Wildlife Federation, the Albuquerque Chapter National Wild Turkey Federation, the New Mexico Riparian Council, the New Mexico Friends of the Forest, the Environmental Education Association of New Mexico. Dr. Becker also served as the State Coordinator for the Leopold Education Project and supervisor with the Valencia Soil and Water Conservation District. He enjoyed hunting, fishing, and wildlife photography. Dr. Becker was a member of the New Mexico Mountain Club and the Rio Grande Mule and Donkey Association. Dr. Becker passed away in 2007. This article was originally published in EE Connections for Spring 2014 [PDF].